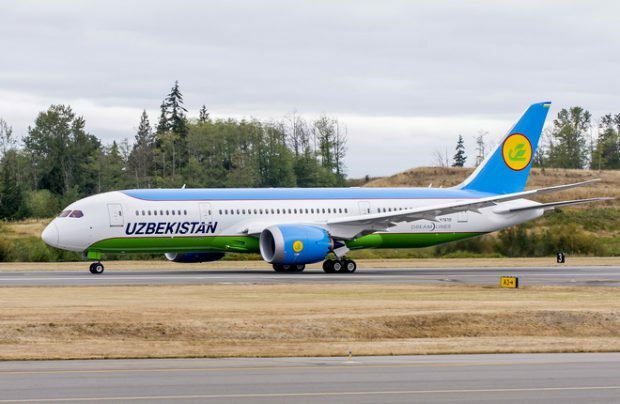 In a move to support its international network development strategy, Uzbekistan Airways (UA), the flag carrier of the Republic of Uzbekistan, has finalised an order for a new Boeing 787-8 Dreamliner, valued at US$239 million at current list prices, Boeing has confirmed. UA currently operates two Dreamliners and, with this new order, will add four more B787s as part of its plans to refresh and expand its fleet. “The agreement for an additional Boeing 787-8 supports our development strategy which is focused on the modernisation and expansion of the airline’s fleet and network, and marks another great milestone in our long-term co-operation [with Boeing],” says Gennadiy Kharlap, the airline’s deputy general director. Its first GEnx-1B-powered B787 entered service with Uzbekistan Airways in 2016, thus becoming Central Asia’s first Boeing 787. UA currently deploys its two, 246-seat B787s on international routes, including to Europe, south-east Asia, Japan and the USA. The airline’s third B787, which is due to be delivered in mid-May, offers the greater capacity of 270 passengers (24 in business class and 246 in economy), as well as a crew rest area. Meanwhile, the airline is boasting a 100 per cent dispatch reliability for its Dreamliners, its fleet of which will grow to six of the type before 2020, the airline has revealed in a statement. In a successful 2017, the Uzbeki carrier transported 2.7 million passengers, a 9.4 per cent improvement year-on-year, and UA’s first increase in several years. Uzbekistan Airways currently operates 21 passenger aircraft, including two Boeing 787-8s, six Boeing 767-300ERs, four Boeing 757-200s and nine Airbus A320s. Four more aircraft – one B757 and three Avro RJ85 regional jets – are believed to be in storage. The airline also operates two Boeing 767-300F freighters and two government VIP aircraft – a B767-300ER and an A320. On May 1 it officially phased out the last of its Russian/Soviet-made Ilyushin IL-114 regional turboprops, thereby becoming an all-jet operator.